If you think your team was on the receiving end of a poor result this weekend, then spare a thought for Italian minnows Pro Piacenza. 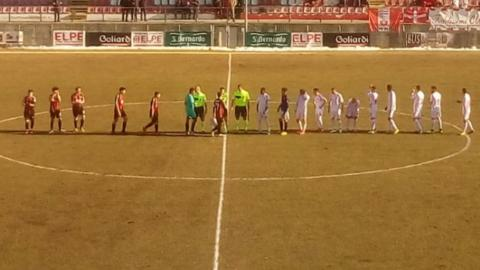 The Serie C Group A strugglers were beaten 20-0 - yes, that's twenty-nil - at league rivals Cuneo on Sunday afternoon. They were trailing 16-0 at half-time, with Cuneo's Hicham Kanis scoring six goals before the interval, and fellow striker Edoardo Defendi getting five. In Pro Piacenza's defence, there were mitigating factors. Currently bottom of Italy's third tier, the northern club are in serious financial trouble. They were deducted eight points earlier in the campaign and have reportedly failed to pay their players since August - resulting in the resignation of the majority of their first-team squad. They had failed to play any of their past three fixtures prior to Sunday's defeat, and another no-show at Cuneo would likely have resulted in their disqualification from Serie C.
The visitors managed to field enough players for the game to go ahead. Unfortunately for them, that meant starting the match with a seven-man team that included six teenagers. With no coaching staff available, 18-year-old captain Nicola Cirigliano also had to take on the role of manager. They finished the match with an extra player after one of the younger members of their squad was able to locate his identity papers after the game had kicked off. Cuneo had only scored 18 goals in their 24 league matches before Sunday's game, but managed to double their tally for the season in 90 extraordinary minutes. With severe financial difficulties confronting them, Pro Piacenza are set to face an Italian Football Federation hearing to decide their fate on 11 March. Gabriele Gravina, president of the Italian Football Federation, described Sunday's result as an "insult to sport". "In this surreal situation, the FIGC [Italian Football Federation] had a duty to enforce all the rules," he said. "Our responsibility is to protect the passion of the fans, healthy entrepreneurs and the credibility of our championships. "The one we unfortunately witnessed will be the last farce."